Mouth music/lilting is also a common method of teaching fiddle tunes in many cultures. It’s also used to commit tunes to memory. Loved it! I pulled out the contemporary “mouth Music” cd and listened to it as well. Beautiful one! I particularly enjoy his rhythmic sureness and seamless metre changes. I can’t have been paying attention in January, as I missed this one – one of the few on which I might have something useful to contribute. I think it’s true that the highland bagpipes were banned for some years after Culloden as, among other things, they had (and still have) a martial function, so were probably associated with the possibility of rallying anti-Government forces. But you have to bear in mind that there are few episodes of Scottish history over which there is more romantic nonsense talked than the Jacobite rebellion. I doubt very much if other instruments were banned. Even if they were, it seems unlikely that they’d have been suppressed very successfully – imagine a scattered army trying to stop people who live in a remote mountainous and moorland region from playing the fiddle. 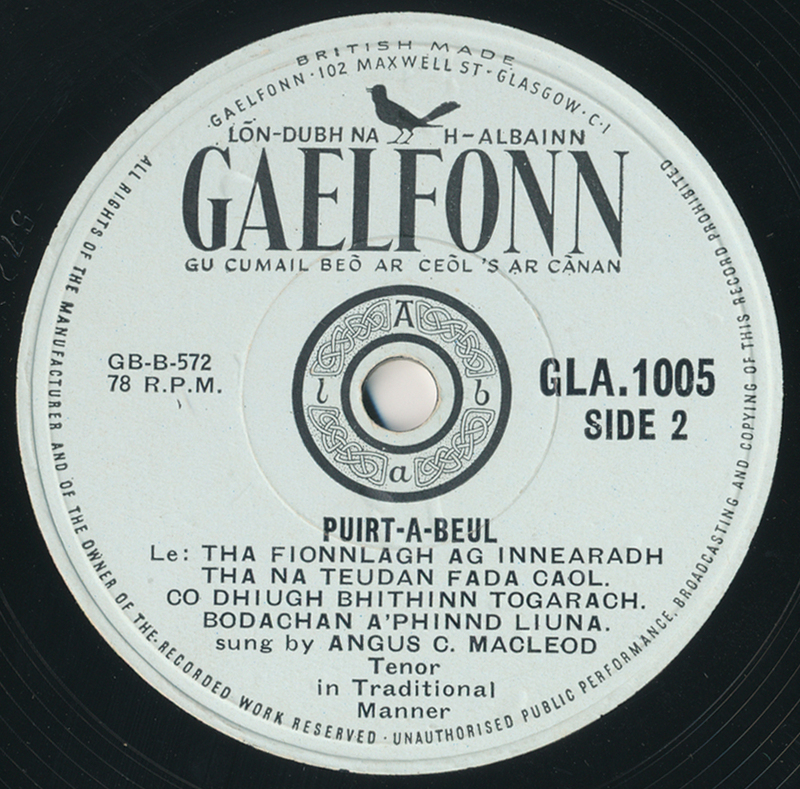 But it’s probably true that puirt-a-beul has origins in providing music where no instruments were available, as diddling was in northeastern Scotland and lilting was in Ireland, as you suggest. Haji Maji’s also right about mouth music being used to memorise and teach tunes. The bagpipe has its very own variety of such music, called Canntaireachd (Wikipedia has a neat little outline of it, for anybody interested), which is very strictly syllabic, and while it sounds more meaningful than diddling, has in fact (so far as I know) no linguistic significance, unlike puirt-a-beul, which uses real lyrics. Canntaireachd was first written down in the late 18th century (i.e. later than Culloden), but its origins are understood to be very much older. Anyway, it seems unlikely that there’s any connection between the banning of the pipes and puirt-a-beul. I have very little Gaelic, but I think that the order of tunes is 1. Co Dhiugh Bhithinn Togarach; 2. Tha Na Teudan Fada Caol; 3. Tha Fionnlagh Ag Innearadh; 4. Bodachan A’Phinnd Liuna. All four of these certainly could have been fiddle tunes first – Nos. 1, 3 and 4 are reels and 2 is a strathspey. Thanks, gracenotes! As always, your thoughts and helpful information are most appreciated (and illuminating)! No, the ban on pipes is a complete fiction from top to bottom. They are not mentioned in the Disarming Act or contemporary accounts. The high age of piobaireachd composition continued unchecked, and Joseph MacDonald wrote his treatise on the instrument in 1760 with not a mention of any ban. As far as anyone can tell, it arises from the nonsense inserted as the introduction to Donald MacDonald’s collection of piobaireachd published in the early 1820s.